Today’s book is brought to you by Zondervan. 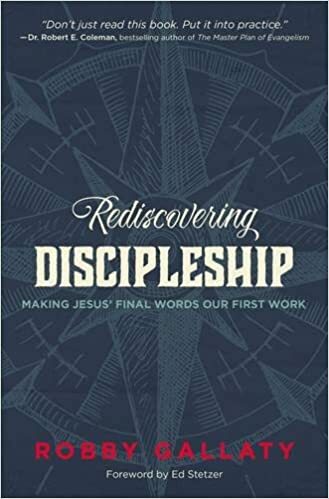 What does it mean to “make disciples?” That’s one of the key questions that Robby Gallaty’s book Rediscovering Discipleship seeks to answer. Further, Gallaty works to address what it looks like to actually do the work in our churches. First, let’s look at the structure of Rediscovering Discipleship. Gallaty gives us thirteen chapters, broken in two major sections. The first section, comprising seven chapters, looks at how Jesus made disciples. The second section parlays that into how we can emulate Jesus. Second, let’s look at the rightness of the overall premise. Has the Church neglected discipleship such that it needs rediscovered? Gallaty makes the case well that this is true, at least of those parts of the church in the United States of America. He’s right—both the witness of the Church in the world around us and the experience of those within the church support the lack of depth in our discipleship. Third, let’s consider his recommended solutions. He recommends such ordinary means as time, Bible reading, and personal relationships. Since his concepts are based in the same practices that we see Jesus use in the Scripture, it’s hard to argue with that idea. Some of his suggestions stem from ideas used by Wesley in the development of the Methodist way, which is not bad unless you turn legalist with it. This is, honestly, the biggest threat to most discipleship groups and plans. The step from “accountable” to “control” is a short one in the wrong direction. This is one of the main killers of discipleship these days, the trip and fall into legalism—or the fear of doing it so that you never start! The above fear is why we need community and not commanders in the church. How practical is this book? Immensely. I would highly recommend this as one of the better practical books on church growth I have seen. What is the one major flaw? Zondervan saddled it with endnotes instead of footnotes. Beyond that, it’s well worth the time and study. I did receive a free book in exchange for the review.